With a requirement for safety barriers, MF Freeman, the main contractor on this project, opted for a Kee Klamp® guardrail system. These fittings are hot dip galvanised, making them more resilient to corrosion, which was an important consideration for this environment. 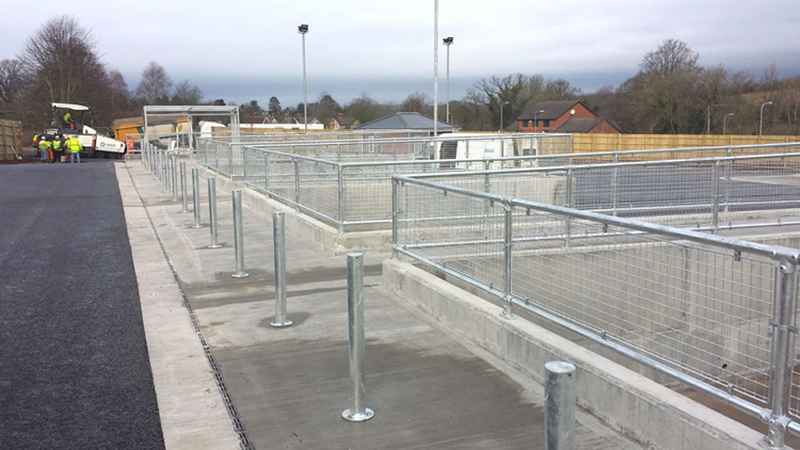 Supplied via Kee Systems, 120m of Kee Klamp® safety barriers were installed around the recycling centre. To ensure complete customer safety while visitors drop their waste into the individual bays, mesh infill panels were added to the guardrailing system. As no welding is required, the safety barriers were constructed quickly and easily on site. The Kee Klamp® range offers outstanding versatility and is suited to a range of guardrail applications. Manufactured from galvanised cast iron, the Kee Klamp® system securely joins structural steel tube into almost any conceivable configuration across a variety of angles. Designed with ease and speed of installation in mind, the components completely eliminate the need for hot works on site, resulting in significant cost and time savings. Neither specialist labour nor tools are required as Kee Klamp® fittings can be installed using a standard hex key, with each fitting incorporating an internal set screw to lock the respective fitting safely and securely onto the tube. Kee Systems’ mesh barriers are constructed from heavy gauge tube and have a welded mesh infill, making it very strong and durable, whilst being light and easy to handle. The three and half metre span of the mesh barrier combines economy and strength with fewer components per metre, which makes it the ideal choice for the construction industry.